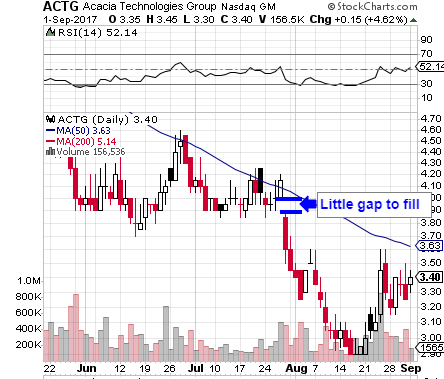 Pretty much the entirety of 2017 has been some tough sledding for ACTG, which was in an overall downtrend since last winter when it was trading at more than twice its current value. That all seemed to change around midway through last month, as the stock has managed to establish a good rebound effort for several sessions. In the premarket the stock has broken previous resistance which coincided with the 50DMA (3.63) and could make a move to fill that gao we’ve pointed out on the chart below. We’ll put the stock on watch in the days and weeks ahead as we kick off this holiday-shortened trading week. After posting key data reflecting positive top-line results in its Phase III lung disease treatment study, INSM has exploded into the blue sky this morning. The stock has rapidly gained more than twice its value in premarket trading, and whenever we come across a situation like this, we begin to look for the options contracts that could give us the best opportunity for rapid gains. We think that the INSM 09/15 $27-30 Calls could stand to see some nice activity if the stock continues the blue-sky breakout we’ve witnessed so far. BVTK was among our mentions in Wednesday’s premarket report after it was unearthed in our chatroom* the previous morning before making a 500% move. Those who missed that run got another chance right away as the stock ran from .0009-.0035 that afternoon, and topped out at .0041 to close out the short week on Friday. That added another two-day swing of 355% to the activity we had observed in BVTK, which was followed by a pullback to .0015. Once again, to kick off the new trading week yesterday, BVTK began to run, returning to a high of .0034 on the day, representing yet another two-day upswing out of this volatile runner amounting to 127% The stock ended the session having traded roughly three-and-a-half times its monthly average volume. Things could get very interesting if it can manage to crack resistance at the previous swing high of .0041. Whenever we spot an opportunity to swoop in post-earnings with some options ideas, we jump on it right away, and that’s what we have with BAC this morning. We haven’t highlighted this stock in quite awhile,but with a very solid beat on earnings and a small gap-up in the premarket, we’re going to want to signal a couple of short term contracts for observation in the BAC Weekly $22.50 and $23 Calls. In the event that a more sustained rebound is in the cards, considering the fact that BAC was already coming off of a relative bottom just yesterday, we’ll have the BAC 05/12 $23.50 & $24 Calls on watch as well. We want to put an observational tag on both Sorrento Therapeutics, Inc. SRNE and OncoMed Pharmaceuticals, Inc. OMED. Both of these stocks have taken serious beatings of late, and consequently, are in extreme oversold territory. Chances for recovery plays here seem quite high, so we’re going to watch for these to establish higher lows in sessions ahead. Yesterday turned out to be a nice bullish session for DLTR, making us glad we added it as a focus in our premarket report. No sooner than we updated our readers on the DLTR options ideas we submitted in last Wednesday‘s premarket report, did they take off to new highs once again. We can continue to keep these contracts on our radar, with more than three weeks remaining until their expiration date. We slated the PBR 04/21 $9.50 & $10 Calls for observation a week ago today, and must now swing back around to highlight the excellent moves these plays have made in a week’s time. As stated on the above mentioned play, these contracts have more than three weeks before expiration, so we’ll continue to keep tracking their activity in coming sessions. Yesterday the stock closed just under the 200DMA of 9.69, and we’ll remain bullish on these ideas if the stock can break past that barrier. All of this activity on the newsreel is happening concurrently with a potential reversal and rebound on the chart. The stock has been failing to satisfy its $1.00 minimum bid requirement for the better part of nine months now, and will need to get itself back above that mark or it could face delisting after just three years on the NASDAQ. Our initial flagging of HTGM in Thursday’s premarket report and afforded us the chance to see shares changing hands as low as 2.85. We observed a great run that day, and reminded our readers that we’d be keeping it on our radar on Friday. It’s a good thing that we did, because the real party had only just gotten started. Friday’s session brought a next-level run from 5.97 to a high of 13.25. That works out to an intraday rip of 122% and a total two-day upswing of 365% over our observed low from Thursday. It went so crazy on Friday that it had to be briefly halted twice, and the stock is showing some interesting premarket activity today, so be sure to keep an eye on HTGM. Volatility like this is a swing-traders’ dream. This was another stock we highlighted in Thursday’s report, and after seeing an intraday spike of 74% that day (.0056-.00975), it would also end up primed for an even more impressive run on Friday. We noticed an increase in volume and price activity in TXTM on Friday, and the company has announced a new acquisition that will have it appearing in news feeds today (>>View PR). We know the stock has the ability to take off quickly, as evidenced by its rapid run from the triple-zero range to .0056 at the end of January which we covered extensively in our daily traders chats*. That’s another reason why we want to reserve a slot on our watchscreens for TXTM today. *Any of our readers who want to participate in our daily chats just need to send a Skype contact request to username ‘stocksumo’.